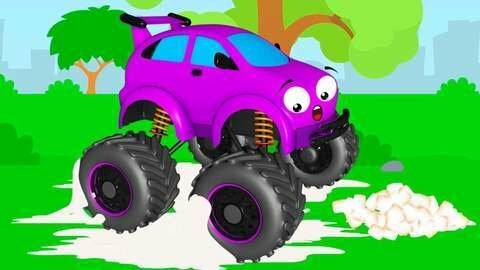 Watch how the purple Monster truck gets stuck to the ground because of the Yellow Car’s roasted marshmallows in this car cartoon for kids. The Helicopter tries to get the Monster truck unstuck but it ends up being thrown in sky because the line snapped. It fell in a group of cars having a picnic before it jumped and crashed into a building. There are other free car cartoon for kids that you will find at SeeZisKids.com so go and visit them today.